The venue may be around two years old but it was a first for me. 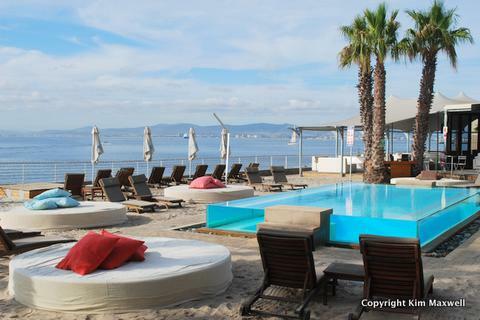 A persistent PR company had repeated their invitation to come and sample the winter menu at Shimmy Beach Club. On the house. So when a gap materialised at short notice I called a friend who eats out a fair bit and we met there for lunch. I liked the ordered chaos of driving in a less frequented part of the harbour past boats under repair and waterfront roadworks, then parking under the looming Port Authority building. In contrast, entering Shimmy’s felt a little surreal, a large L-shaped space enclosed in floor-to-ceiling glass that opens to bring in the outside. Bars and loungers are dotted about, interiors filled with loud decor elements and anonymous art. There’s a deck where it’s easy to imagine beautiful young things hanging out ordering cocktails and finger food. It overlooks oversized cushion seats with beach sand underfoot and a glass-wrapped pool where unusually, adult swimming or aquatic lolling is allowed. The restaurant shares the same view, flanked by Cape Town’s harbour and Atlantic Ocean behind. On an occasional sunny day when you’re trying to ignore a fairly rainy winter, it’s pretty darn appealing. The menu offerings are as slick as the rest of Shimmy’s, and seem to primarily target business lunchers, attractive partygoers and new monied types happy to share platters while dining out in groups. Chef Adrian Cook (appropriate name, isn’t it?) mentioned he’s trying to move away from the venue’s reputation as a nightspot. The chef has trimmed the menu significantly since he started in September 2013, which is saying something because the sushi section alone fills three pages. For the rest, diners apparently order salads to share or pizzas with the likes of caramelised onion and goats cheese (R105) as toppings. There are steaks and pastas with modern, non-Italian sauces. But in keeping with its harbourside location the number one Shimmy seller is seafood. You’ll pay accordingly of course. Cook says seafood platters are popular here: it’s R800 for two sharing, and R8000 to feed 20, but then they do include crayfish and langoustines in the fishy mix. While crustaceans were visible on other lunch tables, we tried more modest menu options. The chef recommended a cured duck breast starter with aioli (R95). A success with multiple slices wrapped into a roll, served with tasty aioli creaminess and a sticky-salty dark sauce. Strawberries and basil leaves freshened it up. Shimmy Ritz (R85) promised a twist on the usual avo-prawn favourite and visually it didn’t disappoint with a deconstructed slate plate showing all the bits. 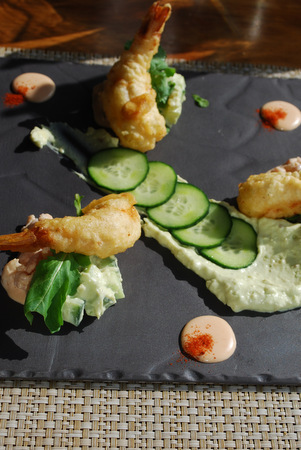 But on tasting, the tempura prawns lacked batter seasoning, and the Marie Rose sauce was thinner in texture and flavour than most versions I’ve tried, or made. As a main course the portion was ample: Indian flatbread, rice and poppadum were included alongside tasty atchars, aside from creatively prepared vegetable and potato accompaniments for the table. 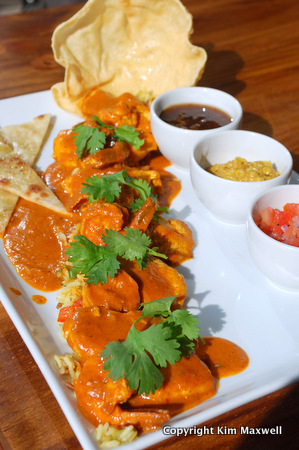 But I’d prefer a Cape Malay chicken breast and prawn curry (R170) with greater depth of flavour to knit its elements together. 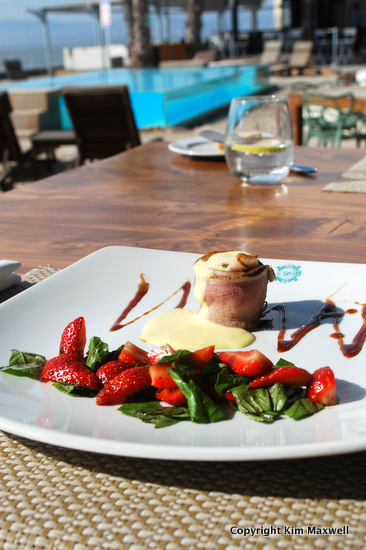 The catch of the day offers great value at R85. Cook serves sustainably sourced fish where possible, a mean feat for a restaurant that serves 600 covers during lunch and dinner in season. Yellowtail easily dries out but my fish fillet was succulent and delicious after grilling, if an odd match with mushy peas. Points go to the waitress who recommended a side sauce of salty Asian Tsumi glaze to give the fish extra zing. Sadly a shared dessert of apple and buttermilk upside down cake (R45) disappointed, but Americano coffees were strong and properly made. There is certainly a place for Shimmy in Cape Town’s food scene, but the pull here is always going to be about the location. You often don’t feel like thinking about a menu in a spot where the view and quieter daytime vibe encourage relaxation. So I’d be more inclined next time to pop down for a simple pizza with my toddler in tow, to enjoy beach sand, an indoor play area and – in warmer weather – the separate child-friendly infinity pool.